Capt Jim Klopfer has been fishing in Sarasota, Florida since 1985. He earned his USCG license in 1991has been running Sarasota fishing charters ever since. In that time he has gained experience that only time can provide. Here he shares that experience in his Sarasota fishing forecast. Capt Jim also shares a regular Sarasota fishing report. Every year is different, but annual fishing patterns tend to repeat themselves. Our seasons do change, though the change is more subtle. Slight changes in water temperature will trigger fish migrations. The length of time the sun is out is a factor as well. Tactics change with the seasons as well. Water temperature, bait availability, and other factors will affect how fish feed. My Sarasota fishing forecast does hold up over time as a guide that anglers can use to predict fish locations and tactics. Most fish species make some type of migration. Resident fish such as speckled trout, snook, jack crevelle, and redfish stay in a relatively small area, but do change locations. A cold winter will push them into deeper water in channels and creeks and canals. As it warms up they will move out into the bays to feed up. In the summer they will seek the depths of cooler water while snook move out onto the beaches. Other fish species migrate through the area, called “pelagic” species. They include Spanish mackerel, king mackerel, tarpon, false albacore, sharks, cobia, and more. Pelagic fish generally school up in good numbers. They also are very much keyed in to bait. Bait fish migrate as well and this in turn affects the pelagic species movements. Sight casting to schools of fish that are feeding voraciously on the surface is incredibly exciting! Any lure, bait, or fly that is cast into the melee is instantly devoured! We also have other fish that are seasonal. These include sheepshead, pompano, bluefish, flounder, sea bass, and more. While these species are occasionally taken all year long, there are specific times when they are much more plentiful. All of the fish movements, locations, and techniques will be explained in these Sarasota fishing forecasts. Weather is the overwhelming factor in winter fishing in Sarasota. While winters are much milder than other parts of the country, we still experience them. The water temperature will be the lowest all year, sometimes into the upper 40’s! That is cold for our fish species. Here is my Sarasota winter fishing forecast. Cold water will push fish off of the flats and into deeper holes. Speckled trout will be found in channels with deeper water, as will ladyfish and other species. A free lined live shrimp is very effective. After a couple of warm days, fish will move back out onto the flats. Fish that are on the grass flats will be a bit deeper. Flats in 8 feet to 10 feet of water will be more productive. Bluefish, jacks, trout and pompano will take a 1/4 ounce jig with a grub tail. Smaller baits, no longer than 4″, are generally more productive. By the end of winter, the deep flats should be very productive with Spanish mackerel joining the party. When the winds ease up for a couple of days and the water clears, both passes can be very productive. It is important for the water to be “clean”. When it is, ladyfish wil be piled up in Big Sarasota Pass and New Pass. Mackerel, pompano, bluefish, jacks, and other species will be caught as well. Drifting with the tide while casting or vertically jigging is a proven technique. Live shrimp either on a jig head or free lined will also catch a lot of fish. Structure such as docks, bridges, seawalls, and rocky bottom will hold fish in the winter. Any quality Sarasota fishing forecast will include bottom fishing for sheepshead and snapper. This is very easy fishing as anglers simply find some good structure and fish live or frozen shrimp on the bottom. Flounder, black drum, redfish, and more will also be landed. Sheepshead are a very popular winter target for Sarasota anglers bottom fishing. They will bite in cold, dirty water. On windy days, docks in residential canals offer some protection. Surf fishing will depend greatly on wind. Wind churns the water u, making it rough and dirty. Fishing is poor under these conditions. However, when the water is calm and clean, silver trout, whiting, pompano and more will be caught. I live shrimp or piece of shrimp on a #1 hook with just a bit of weight works well. A shrimp tipped jig is a great choice as well. 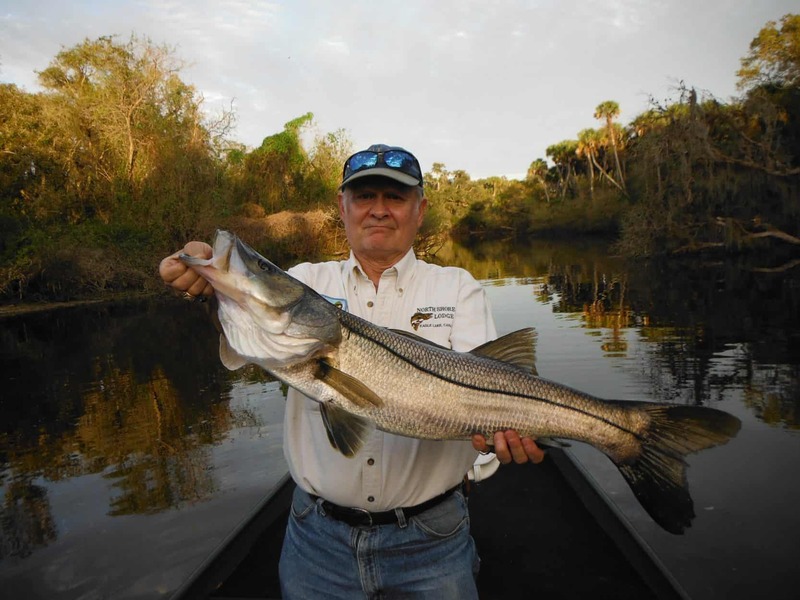 In the winter, snook and jack crevelle migrate up into area creeks and rivers. Rivers have deep holes and darker water. This results in significantly higher water temperatures. Gamefish seek the warmer water, as well as the forage. 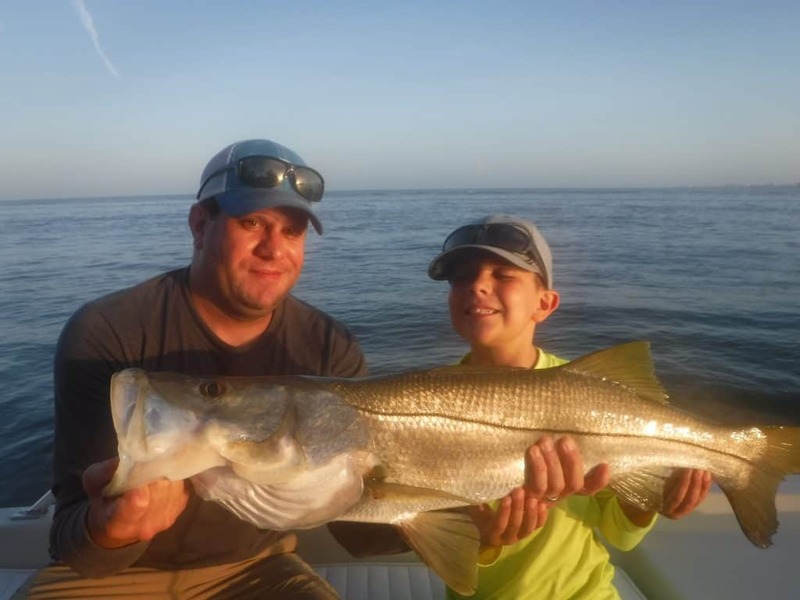 Capt Jim offers anglers visiting Sarasota a unique oportunity, fishing for large snook in area rivers. The Myakka River, Manatee River, and Braden River all hold snook, big jacks, redfish, and more. 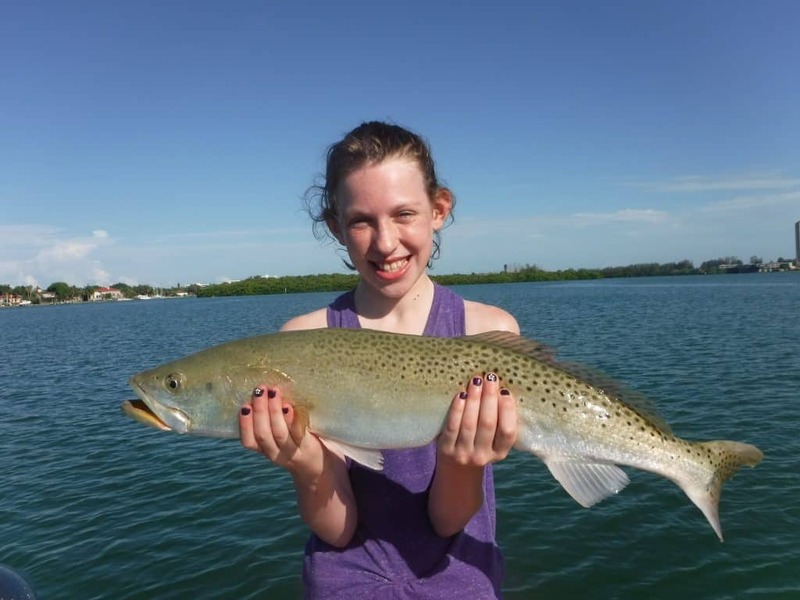 Read more about Sarasota river fishing. Rapala plugs and swim baits are generally used as it allows anglers to cover a lot of water. The scenery is also very cool! I hope you enjoyed my Sarasota winter fishing forecast! Spring is a fantastic time of year to be fishing in Sarasota. The biggest question anglers have to answer is what to fish for! Just about every species is available this time of year. Sheepshead are still present early and tarpon will have shown up by late spring, with just about everything else in between. Sarasota spring fishing can be fantastic! Both the deep and shallow grass flats will come alive in spring. Speckled trout, Spanish mackerel, bluefish, pompano, jacks, ladyfish, and more will be caught on grass flats in 5″ to 10′ of water. The flats near the passes will be very productive. Anglers drift with the wind and tide and cast their baits out, searching for a school of fish. Most fish will be found in schools or bunches. Live shrimp and a 1/4 ounce jig are the two most popular baits. Shrimp can be fished undr a float or just free lined out behind the boat. Snook, redfish, jacks, and trout will move into the shallow flats as they warm up and forage becomes available. It seems like a contradiction, but the largest fish often inhabit very shallow water. Artificial lures that cover a lot of water are often the best choice. Plugs, weedless spoons, and light jigs are the top choices. Low, incoming tides are best. A live hand picked shrimp can work very well in water that is just a tad deeper. Both passes will be great options for anglers Sarasota spring fishing. The rocks in Big Pass will still hold sheepshead, though their numbers will be dwindling. Snapper will still be plentiful. Drifting the passes while bouncing a jig will produce a LOT of ladyfish along with mackerel, blues, and pompano. When conditions are right, fishing the inshore Gulf can be world class. East winds will result in calm, clear water. Hordes of bait fish will move in, followed by the predator fish. This is one of my favorite types of Sarasota fishing charters. Spanish mackerel and false albacore will be seen feeding actively on the surface. King mackerel, sharks, and even tarpon will be mixed in, especially . Casting small spoons, jigs, plugs, and flies is great sport! A chunk of cut mackerel on a large hook with a steel leader will catch some fun sized sharks. Surf anglers Sarasota spring fishing should do well when the water is clear. Trout, whiting, pompano, Spanish mackerel, bluefish, flounder, and ladyfiish will be caught using both live shrimp and lures. High tides are best. Many of the clients that go out on a Sarasota fishing charter are surprised to learn that fishing can be outstanding in the summer. The key is the abundance of bait through the inshore bays and passes and out on the beach. Catching bait and using it as chum is extremely effective. It is very hot, however, and fishing needs to be done early or late. Heat indexes are very high mid day and the fish normally don’t bite as well. Get out there early and do some Sarasota summer fishing! Fishing on the deep grass flats from 6′ to 10′ is outstanding in summer. What I like to do is start out at first light casting jigs. That bite will last an hour or two, depending on the breeze and overcast. Once that slows, I move in and load up on bait. Using my cast net, I fill the well with small live monnows. I then anchor up-tide and up-wind of a good flat. Live minnows are tossed out behind the boat, attracting gamefish up behind. Speckled trout, mackerel, snapper, grouper, bluefish, ladyfish, and more will readily take a live bait in this situation. Action on the shallow flats will depend on water temperature. If it gets too warm, fish will move off deeper. But, as long as the water temperature hangs arounf 85 degrees and bait is present, anglers should succeed. Snook fishing is very good in summer as well. Just keep in mind that they are out of season and must be eleased immediately. Anglers Sarasota summer fishing for snook will find them in the passes and out on the beaches. Live bait works well when fishing the passes. The water is deep in spots and the current can be swift. Large pilchards and threadfin herring along with shrimp, pinfish, and grunts all work well. Heavier jigs with a large swimbait tail can also produce vertically jigged while drifting. Out of the beach, it is a completely different situation. While anglers can use bait, artificial lures and flies work well, and are a better option for shore fishermen. Any small, white jig, plug, or fly will fool them. Snook can be seen right i the surf line, cruising the beach. Sight casting to snook is great sport! Sarasota sees a strong tarpon migration each year in late May and summer. These fish average 75 pounds and grow over 200 pounds. Tarpon are the ultimate gamefish and the opportunity to cast to them with relatively light tackle is a unique one. This is not for every angler. There will be days that no fish are hooked. Tarpon fishing is “big game” fishing and the success rate is lower than that with smaller fish. Fall is an awesome time to go out on Sarasota fishing charters! The weather is usually fantastic with cooler temperatures and the crowds are non-existent. Angling opportunities abound as fishing is good both inshore and in the coastal Gulf of Mexico. Fall is generally the best time to target Spanish mackerel and false albacore in the Gulf. Just about every inshore species will be available this time of year for anglers Sarasota fall fishing. Speckled trout, Spanish mackerel, bluefish, jacks, pompano, snapper, and ladyfish will be caught on the deep flats. Jigs, plugs, and live shrimp will all produce. Chumming with bait fish will be effective until the bait leaves, which is normally around Thanksgiving, but every year is different. Snook will move back into the bays and scatter out and feed as winter approaches. Topwater plugs, jigs, and live bait will produce around oyster bars, mangrove shorelines, and docks throughout the area. Redfish will be schooled up in large numbers on the shallow flats, especially up north near Long Bar. Weedless spoons and light soft plastic baits work well, but these fish can be spooky! Passes should be thick with ladyfish, with pompano, Spanish mackerel, and bluefish mixed in. Anglers can find the current Florida fishing regulations at the FWC site. I fish the beaches just off of Sarasota and Siesta Key whenever I get the chance in fall. The opportunity to sight cast to breaking schools of ten pound false albacore using light tackle is great sport! On my Sarasota fishing charters, I like to sit out on the beach or slowly idle around in Search of fish. The three artificial reefs off of Lido Key in Sarasota and off Point of Rocks on Siesta Key. Rapala plugs and Bass Assassin jigs are cast out into schools of breaking fish and worked quickly. A hook up is almost assured, especially with mackerel. Sharks are still fairly plentiful and will hit a piece of cut bait such as mackerel. In conclusion, this Sarasota fishing forecast will help anglers understand the species, locations, and patterns that will help them catch more fish.